There may be thousands of games available at the App Store, but there’s always room for pirates. WarShip from Goorusoft answers the call with a pirate combat simulator that’s on sale for $1 as of this writing. We Sail the Ocean Blue: WarShip offers a classic top-down view that zooms in and out as you battle enemy ships for treasure. WarShip presents all of this in a classic top-down view that zooms in and out of the action as necessary. Good graphics meet great audio work and a capable physics system, while responsive touchscreen and tilt-based controls lend a feel of urgency to the game. WarShip uses a stick-and-carrot system that both helps the game and hinders it. While it’s terrific to finish a sea and unlock a new, more powerful ship to pilot, the game places you in a situation where you must continuously upgrade even the most spiffy new ship to stand a chance at beating the current level. Though this keeps you coming back for more, it becomes a grinding process to reach anything new. Hoping that the next ship you defeat drops a few more treasure barrels can get old quickly. Even at its current version, WarShip still feels like an incomplete effort. Although the game runs well under the iPhone OS 3.0 update, bugs crop up. In my testing, the frame rate occasionally became stilted, my ship’s cannons sometimes fired at the wrong target, and colors appeared washed or distorted. In fairness, the developers seem to listen to user complaints—an almost-impossible first stage was made easier when a recent update lent a computer-controlled ally to fight alongside your ship. Still, odd leaps in programming logic, such as being unable to sell your previously-purchased boats in the store, will make you wonder what’s going on. Even with these shortcomings, WarShip proves addictive—it’s fun to take on larger and larger targets as the levels progress. Despite needing touch-ups (and desperately needing a multiplayer mode), your finger wanders back to WarShip on the iPhone’s Home screen and you start to wonder how things will be once you earn that frigate you’ve been saving for. 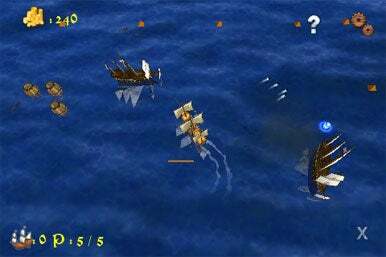 WarShip is compatible with any iPhone and iPod touch running the iPhone 2.2.1 software update.